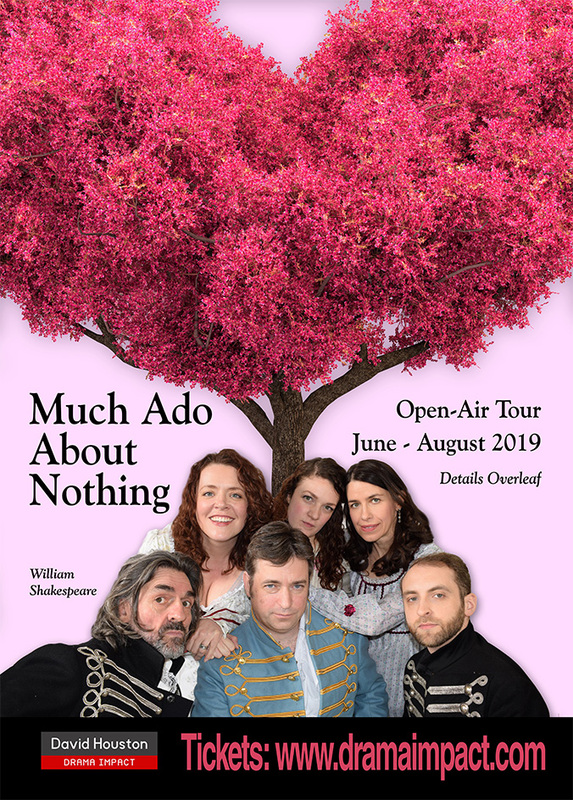 Drama Impact presents ‘William Shakespeare’s’ much loved brilliant comedy ‘Much Ado About Nothing’. Returning from the wars Don Pedro’s men are invited to stay at least the month at Signior Leonato’s house and hopefully, events may detain them longer. Confirmed bachelor Benedick, Claudio hero of the moment, Don John, Pedro’s villainous brother of few words are amongst the guests of honor. Beatrice assaults Benedick with arrows of piercing wit much to the amusement of those gathered. Thereafter passionate tales of young and mature love, battling wits and two explosive sub-plots takes place in a compelling and witty drama suitable for all the family. A 90-minute no-nonsense performance with nine experienced performers. The show is preceded with a Director’s talk on the play and an exciting fun interactive session inviting members of the audience to participate in trying on a costume and speaking some of Shakespeare’s famous words.